Among the most stately but slow-growing broadleaf evergreen plants for the garden, holly trees (Ilex spp.) are beloved for their toothed leaves and displays of colorful berries that persist through winter. Two classic holly tree species are American and English holly, each maturing into a tall pyramid-like tree anywhere from 30 to 50 feet tall and 20 to 40 feet wide. American holly is more cold tolerant, grown in U.S. Department of Agriculture hardiness zones 5 through 9, whereas English holly is best in USDA zones 6 and 7 (or through zone 10 if in the less humid Pacific states) according to Dr. Michael Dirr of the University of Georgia. Perhaps the most important aspect of successfully growing a holly tree is the quality of the soil. While it's important that the soil is fertile, moist and well-draining, it absolutely must be acidic (pH lower than 6.8). Non-acidic soils subject holly trees to nutrient deficiencies, especially micronutrients like magnesium, iron and manganese. Maintaining a acidic soil is important to facilitate efficient uptake of necessary nutrients by the holly tree's roots. A lack of nutrients leads most commonly to chlorosis, which is the unhealthy yellowing of foliage. Already slow-growing, if the plant cannot sustain green chlorophyll pigments in its leaves, its food-making abilities are hampered. Subsequent harm from malnutrition leads to premature leaf drop, susceptibility to drought and winter cold as well as insect pests and diseases. Any quality, well-balanced fertilizer product can be used to provide necessary minerals in the holly tree's root zone. Fort Valley State University states an 8-8-8 or 10-10-10 formula suffices. A slow-release formula is best. Focus on a product that is known to create acidic soil conditions. One recommended and specially formulated product for hollies is called Holly-Tone. Other fertilizers that produce acidic soil conditions include those labeled for use on gardenias, rhododendrons/azaleas or needled evergreens. Choose a fertilizer with a urea-based nitrogen source, which is known as a "non-burning" fertilizer that will not harm tender holly tree roots after application. Generally, apply the slow-release granular fertilizer for the holly trees in mid to late fall, advises the University of Rhode Island's Landscape Architecture Program. This allows winter and early spring moisture to move nutrients into the topsoil for roots to absorb before the tree creates its new leaves in mid to late spring. The University of Rhode Island also comments that if leaf chlorosis occurs in summer, application of a 10-5-5 formula fertilizer can be added to alleviate the situation during the growing season. A consistent, regular fertilizer application in fall must be maintained. As a general rule, notes Yardener, apply the granular fertilizer at a rate of 1 to 2 lbs. of product per inch of tree trunk diameter. Measure the tree's diameter at 1 foot above the ground. 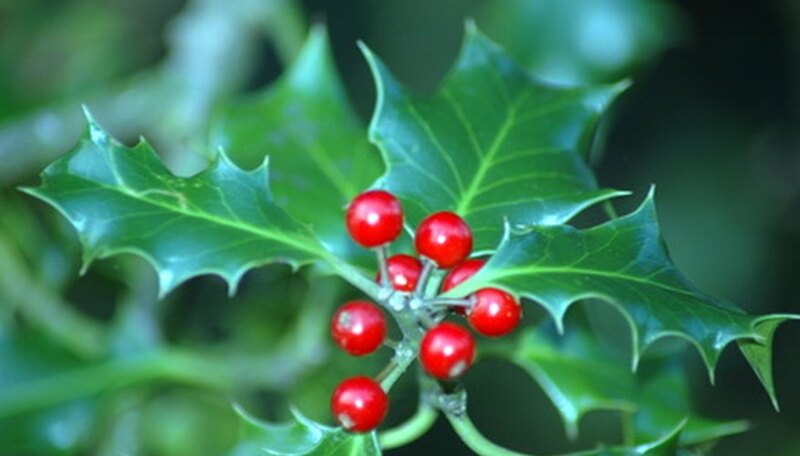 For younger, smaller holly trees (regardless of species), apply 1/2 lb. of fertilizer if the tree's stem base is 1/2 to 1 inch in diameter. In containers or for small seedlings, apply 1 tbsp. of fertilizer per foot of height on the plant, advises Fort Valley State University. Scatter the fertilizer all around the base of the tree to 2 feet beyond the reach of the branches. Holly trees prosper when the soil is rich in organic matter, especially with a mulch that degrades and creates an acidic soil environment. Fallen holly leaves, pine bark, oak leaf mold, and evergreen needles make superb mulch top dressings over the root zone of hollies. Maintain the mulch at a depth of 3 to 4 inches. Scattering coffee grounds twice a year over the usual mulch ensures the soil remains adequately acidic in pH. Apply fertilizer granules directly over the mulch; there is no need to rake back the mulch to expose the soil when fertilizing.